Accomplished English Professor Matthew Zapruder and former U.S. Poet Laureate Robert Hass ‘63 kicked off this year’s Creative Writing Reading Series with “Why Poetry? 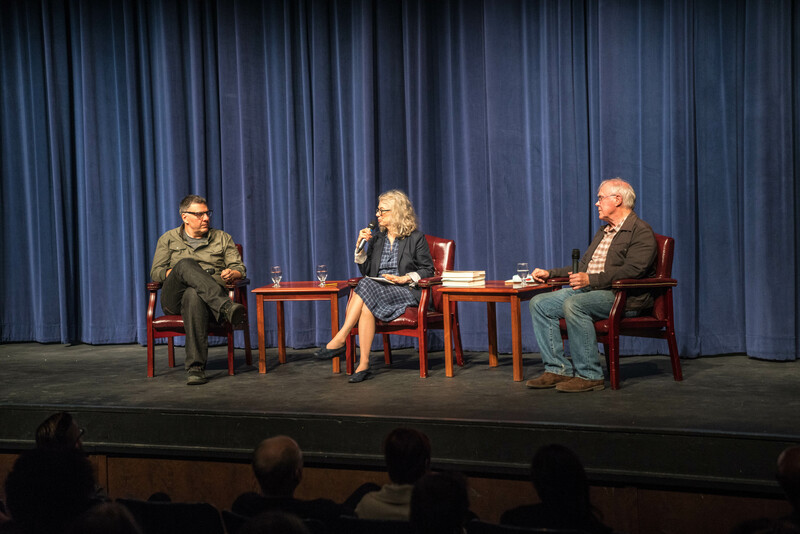 How Form?,” a poetry reading and discussion hosted and moderated by Professor Brenda Hillman, another one of SMC’s own distinguished English faculty members. The event opened on Sept. 7 at 7:30 p.m. to a full house at LeFevre Theater, with audience members of all ages and backgrounds. Hass then read a selection of his poems and discussed the nuances of form in poetry. “I found myself....trying to…show how permeable the relationship is between poems that are trying to ward off deep sorrow and poems that are trying to embrace life-giving goods and the way that even the most amazing poems are tangled together. And that was the task…to write a little book on form.” The mention of this “little book” elicited laughter in the audience—the volume tops out at 464 pages. The next installment in the Creative Writing Reading Series is “Writing the World: From Struggle to Joy” at 7:30 p.m. on Monday, Oct. 9, in Hagerty Lounge, De La Salle Hall.